Communicate with the team manager regarding practice & game schedules, tournaments, and other team-related activities. *Thunder FC trainers typically coach more than one team, thus, conflicting game schedules may prevent the coach from attending a game. In these instances, Thunder FC will ensure another professional trainer is available to coach the game. Volunteers interested in serving in this role should communicate with the VP of Academy and/or team coach. 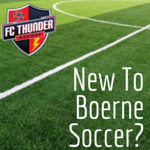 Format: Thunder FC fosters "small-sided games" which is a developmentally appropriate environment for young soccer players. Click here to learn more about this format. Playing Time: Thunder FC has a 50% Play Rule requiring that each player be given the opportunity to play at least 50% of games at which they are present. Players should only use FC Thunder-approved uniforms, warm-ups, and back packs; modification to these items is prohibited. Parents are required to provide cleats, shin guards, and ball (see Game Format Chart for ball size). It is very important players bring a filled water container for all practices and games. In advance of practices sessions and games, players are required to remove all jewelry (eg, earrings, necklaces, bracelets, hard hair bands/clips), sunglasses (recommend using sport glasses, if needed, for medical prescriptions). Considering the prohibition regarding earrings, parent should consider not having a child’s ears pierced in advance of the season such that the child is unable to remove them before practice sessions and games. Players are prohibited from practicing or playing with casts of any type; player is required to provide a signed medical release from player’s doctor or legal guardian before returning for play. Players who are bleeding or have blood on themselves or uniforms must be treated, cleaned, and change uniforms, if necessary, before returning to play.